Siblings | One Mom Talking: The ongoing story of one mom, three teens, and heroin. Five straight good nights’ sleep! And the blessing of their sobriety! I cannot believe that I get to spend this Christmas with all of my children! My boys are doing so well, my son’s girlfriend is also doing great and taking care of herself and my grand-baby-to-be… I have so much to be thankful for. So to you all – those who share a season of blessings and those who are in the midst of the darkness that addiction can bring – I send you my prayers and my love. Keep on living. You are not alone. We’re in this together. God bless! 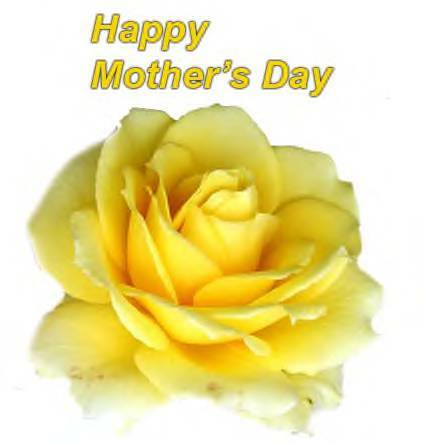 First things first: I want to wish all you Moms out there a wonderful, restful, peaceful, loving Mother’s Day! Even when I’m not showing up here on the Blogs, I keep you all in my prayers. DAN is doing GREAT! Last month I went to visit Colorado, saw the judge, got the restraining order lifted and, for the first time in eight months, got to spend time with Dan. I gave him so many hugs! He’s being promoted in his job and planning to apply to college for the fall. I know that an addict can slip at any time, but I’ve allowed myself to fully accept Dan’s recovery right now. He looks fantastic, has a great outlook on life, and is succeeding in all his programs. It’s amazing how a life can turn around in God’s hands. Amen. AL has 80 days clean! He is still looking for work, but he has also managed to stay in his sober living home and manage his life. He’s had some bumps in the road, but as far as I know they’ve not included using. I still worry about him a little … but each time we talk my worry lessens. It almost seems too good to be true that both boys are in recovery mode and staying there. LYNN is starting to open up. She asked me if she could go to church with me tomorrow — first time since we moved last July! I’m so happy. We’ve been getting along better. And she did really well on her ACT exam for college. What else can I say? I’m working two jobs – which is a little nutsy – but I’m also getting back on my financial feet somewhat. I’m doing a 13-week program at my church “Financial Peace University.” It’s time to put that piece of my life in place. In the meantime, the warm weather is settling in here in South Carolina, and an hour on the beach today did a lot to calm my over-active brain. Now prayer and sleep, and a new day tomorrow. God bless your Mother’s Day! My daughter is still struggling with our move. When we lived in Colorado, she had reasons why she wanted to leave that place and those circumstance. Now that we are in South Carolina, she has reasons why she believes Colorado was better, or why South Carolina is not the best place, or whatever. You get the idea. I figure it’s time for her to learn something we all learn at some point or another: “Wherever you go, there you are.” Perhaps addicts learn this more clearly than the rest of us. Whether in our homes, motel rooms, or on the streets, they still are who they are. And sometimes the only way for them to learn that is for us to take that hard stand and draw those firm boundaries. One blog friend has had to do this recently. It’s painful to read the stories from those who are just getting to that point with their addicts. I’m grateful to be past that right now; and yet clearly aware that I might end up there again someday. Relapse is the unforgiven friend you hope never shows up on caller i.d. It’s all about the journey. Wherever you go, there you are. My daughter will learn in her own time; as we all do. So be the blessing you want to see in the world. 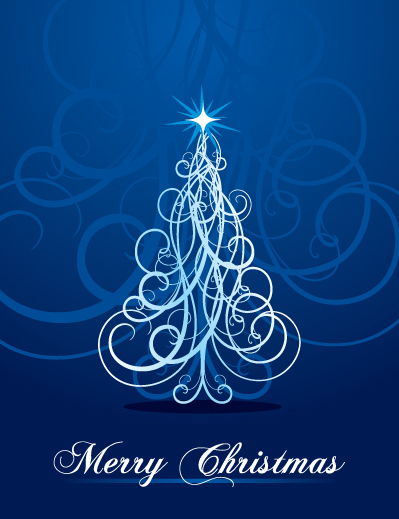 I love you all – God bless! This year, you will be able to easily share your favorite OMT posts on facebook, twitter or by email (buttons should be easily visible with each post). One Mom Talking will be on facebook soon as well. Reaching in and reaching out. God bless! Happy New Year, everyone. 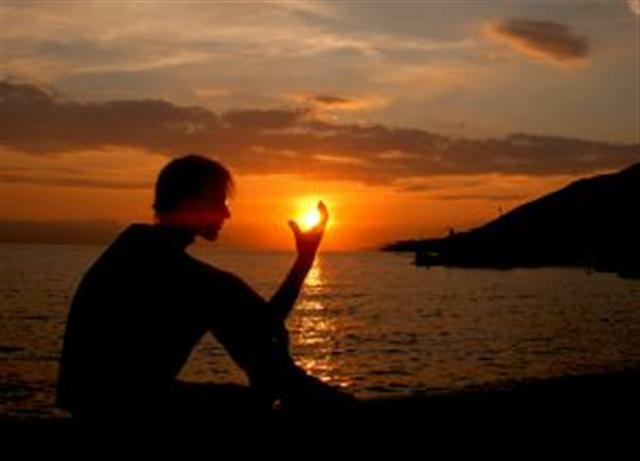 I sincerely hope that 2011 brings healing, spiritual renewal, and a deep sense of serenity into your lives and the lives of those you love. As much as I want to detest 2010 (as if a time period has meaning and character all its own), today I gratefully report that 2010 ends (and 2011 begins) with both of my boys in recovery. I do feel deeply grateful. I’d like to say that I feel Joyful — but that would be dishonest. My melancholy comes partly from needing more time to trust the recovery my sons have committed to, and partly from my own continued need to heal from the addiction that turned our family upside down … and moreso, my daughter’s need to heal, which she has yet to acknowledge. We have an appointment for a mental health evaluation on January 4. I am grateful for that. I’ve been out of work since July and we have no insurance. Luckily the county we are in has this program for high school students, and so we are getting hooked in. All this to say that this year, I take “New Years Day” with a grain of salt. I’ve returned to Al Anon (which I didn’t do much of last year) and what I’m learning is that every day is New Years Day. Every day is an opportunity to accomplish whatever we can, to be the best we can be, to encourage those we love, to start over if we’ve erred, to find gratitude, to love ourselves, to pray for a new start. During 2010, I spent a lot of time trying to decide who is sick and who is well and who is responsible for what … I’ve let that all go. On this fun date of 1/1/11, for today, I’m not playing the blame game. I’m not going to try to analyze my daughter. I’m not going to try to analyze myself. I’m going to tell all my children I love them, bake some corn bread, take down the Christmas decorations, and rest. 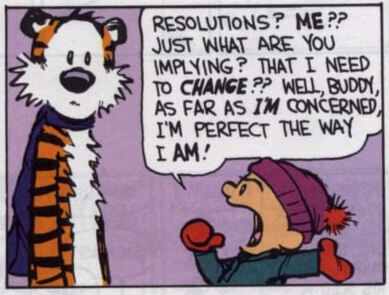 One of my Al Anon friends gave me this prayer: “God, bless [him, her, them] and change me.” I’m going to stop being like Calvin in this comic, and admit my need for change. This is my prayer today. Every day is New Years Day. Thanks for being here, everyone. You true blessings in my life, whatever the date may be.